Colonies Francaises Martinique. Amerique du Sud. 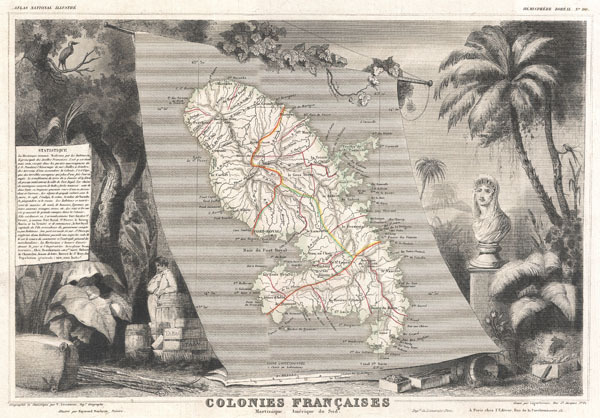 This is a fascinating 1852 map of the Caribbean island of Martinique. Covers the island in full showing roads, cantons, the city of Port-Royal, and various anchorages. The map proper is surrounded by elaborate decorative engravings designed to illustrate both the natural beauty and trade richness of the land. There is a short textual history of the region depicted to the left of the map. Today Martinique, with its French Caribbean culture, lush rainforests, and stunning beaches is considered a jewel of the Caribbean. Published by V. Levasseur in the 1852 edition of his Atlas National de la France Illustree.